Leaves: Alternate, glabrous, sessile to short-stalked; principal leaves oblanceolate, 3 to 14 inches long, .8 to 2.8 inches wide, pinnately-lobed or toothed to nearly entire; uppermost leaves reduced to rigid, entire bracts. Inflorescences: Heads, to 1.6 inch across, numerous, short-stalked to sessile, 1-3 in upper leaf axils or some heads terminal on long branches; raceme-like. Flowers: Showy, bracts in 2 series, outer fewer than inner, about 1/2 as long, with whitish bases and green tips; florets all ligulate, fertile, corolla blue, lavender or rarely whitish; disk florets absent. Fruits: Achenes, glabrous, obscurely ridged, tipped with numerous minute scales, enclosing small seed. Habitat: Waste areas, disturbed sites and roadsides. Distribution: throughout Kansas, but more common in east 1/2. Origin: Native of the Mediterranean region; now naturalized. 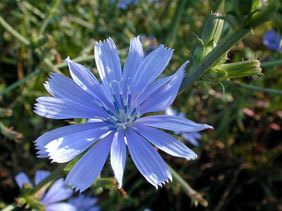 Uses: Chicory foliage has been used for salad greens and the root as a coffee substitute. Native Americans boiled the roots to make a wash for fever sores and steeped the roots to create a nerve tonic. Comments: The flower heads open in the early morning and close around noon on bright days, later on cloudy days. Chicory will give a bitter taste to milk when consumed by dairy cattle. It has a long taproot.